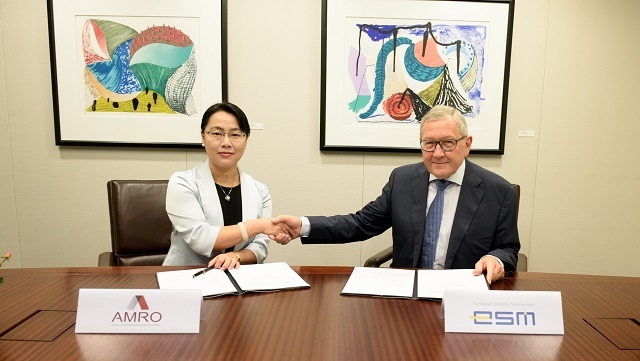 AMRO Director Dr Junhong Chang (left) and ESM Managing Director Klaus Regling sign an MoU between the two institutions in Washington, D.C., on October 11, 2017. Washington D.C., October 11, 2017 – The ASEAN+3 Macroeconomic Research Office (AMRO) and the European Stability Mechanism (ESM) today signed a Memorandum of Understanding (MoU). The MoU provides a general framework to strengthen collaboration in matters of common interest between the two organizations. Among other things, the MoU covers the organization of joint activities, including the dialogue among Regional Financing Arrangements (RFA) and between RFA and the International Monetary Fund (IMF). Examples are the annual High-Level RFA Dialogue, which takes place for the second time today in Washington D.C. and the Joint RFA Research Seminar, which was held for the first time in Singapore in September. The MoU also covers joint research by the ESM and AMRO, technical cooperation, capacity building and staff exchanges. AMRO aims at contributing towards securing economic and financial stability of the ASEAN+3 economies (Brunei, Cambodia, China, Hong Kong – China, Indonesia, Japan, Korea, Lao PDR, Malaysia, Myanmar, Philippines, Singapore, Thailand, Vietnam) through conducting macroeconomic surveillance and supporting the Chiang Mai Initiative Multilateralisation (CMIM). The CMIM is a multilateral currency swap arrangement between ASEAN+3 members, established under the agreement signed by the ASEAN+3 Finance Ministers and Central Bank Governors that came into effect on 24 March 2010. The ESM is a permanent crisis resolution mechanism for the countries of the euro area, established by a multilateral treaty of the euro area Member States on 8 October 2012. The ESM’s mission is to provide financial assistance to ESM Members in a severe crisis. Together with its temporary predecessor, the European Financial Stability Facility (EFSF), the ESM has granted rescue loans totalling €270 billion to Ireland, Portugal, Greece, Spain and Cyprus in exchange for the implementation of economic reforms. Ireland, Portugal, Spain and Cyprus have successfully exited their rescue programmes.